eSports marketing has been dubbed the “next big thing” in influencer marketing. With the eSports community growing larger every year, there is likely to be an increase in brand interest in the industry. In fact, eSports marketing revenue is steadily increasing at a pace of 40% year-on-year. It is estimated to reach $1.18 billion in 2019. A large part of this revenue comes from brand investment, with 80% of the total revenue in 2016 coming from sponsorships and advertising. Considering these numbers, it looks like eSports is only going to become an even bigger marketing channel for brands. But to truly leverage it, you need to gain a better understanding of the community. Who are you reaching out to and how involved are they in the community? What kind of games appeal to them and which platforms do they use? But most importantly, what’s their relevance in 2019? That’s what this post is going to help you understand more thoroughly. Let’s get started. As briefly mentioned earlier, the eSports community is steadily growing every year. In 2017, it had a total of 335 million viewers with 143 million of them being enthusiasts. 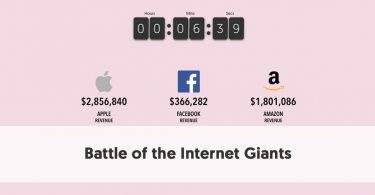 By 2018, the total audience size went up by 13.8% year-on-year and reached 380 million with 165 million enthusiasts. 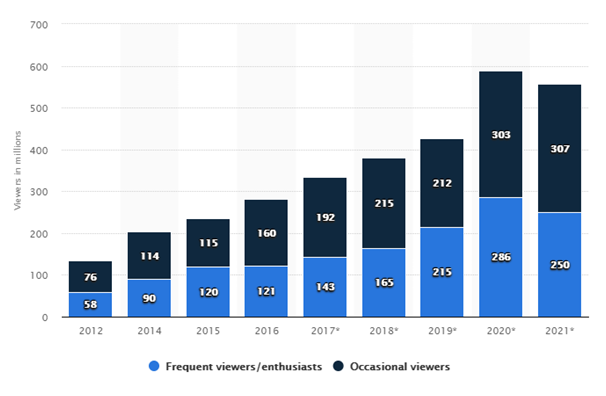 In 2019, this number is expected to grow to 427 million with 215 million frequent viewers. Besides, eSports enthusiasts aren’t always passive viewers. Besides being players themselves, they also help generate quite a bit of revenue for the industry. In 2018, Newzoo estimated that the average revenue per enthusiast was $5.50. This was 20% higher than the revenue per enthusiast in 2017. By 20121, the revenue per enthusiast will likely reach $6.60. eSports mainly have an impact on a younger audience. A GlobalWebIndex survey found that 38% of them belong to the 16-24 age group and 35% belong to the 25-34 age group. But this does not mean that older audiences are not part of this community. In fact, 19% of eSports fans are aged between 35 and 44 and 6% are aged between 45 and 54. The remaining 3% belong to the 55-64 age group. 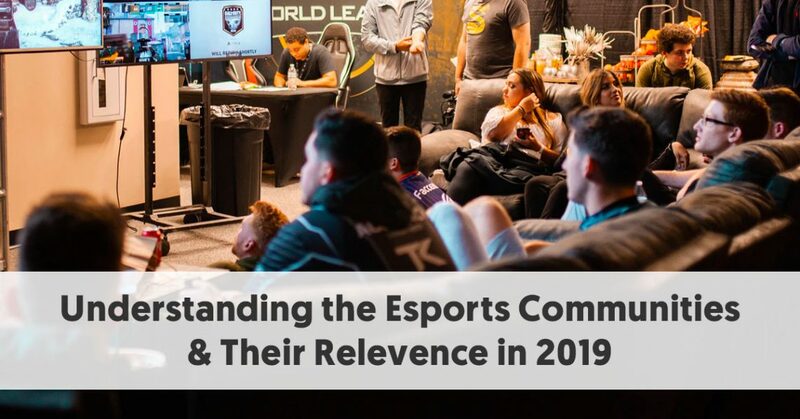 This means that brands can benefit from tapping into the eSports fan community to market themselves in 2019 especially when trying to reach a younger audience. If their products or services are relevant to the community, they could see immense success in their marketing efforts. Even brands like Coca Cola, Mountain Dew, and Red Bull have experienced the impact of eSports marketing. Furthermore, eSports has an impact on a global audience and isn’t just relevant to one region of the world. According to a YouGov study, 7% of British adults, (that’s about 4 million individuals), have watched eSports. While this is a decent number, it’s still small compared to countries like China, where 45% of adults have watched eSports. Singapore also has a sizeable amount of adults who have watched eSports at 26%. Australia comes next with 15% of adults having watched it, followed by the US with 12% of adults having watched eSports. Germany has about 11% of its adult population having watched it. That being said, eSports viewership in Britain is likely to increase over the next few months because of several upcoming events in the UK in 2019. LVP UK will be organising a 2019 League of Legends tournament, with nine teams participating. The UK will also play host to the ESL One Birmingham, a DOTA 2 tournament in which 12 of the world’s best teams will battle for their share of the $300,000 prize pool. And these are just a few of the upcoming eSports events that will take place in the UK. Although Twitch and YouTube may be the main platforms where eSports audiences watch live gaming events, their media consumption and engagement does not end there. They use other platforms to engage in conversations about eSports and consume relevant content. According to a Pulsar analysis, most activity happens on Twitter. 42% of eSports audiences in their analysis use the platform to get the latest eSports news. 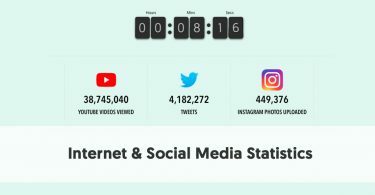 Instagram takes second place, with 19% of audiences using it to engage with eSports meme culture. Next is Tumblr, where 17% of audiences engage in conversations around league performances. 12% of audiences use Reddit forums to read and/or participate in conversations about post-match analysis. 8% also use YouTube for video replays and event highlights, besides using the platform to watch live events. Brands will need to consider the separate uses of these platforms when strategising for their marketing campaigns. You will need to consider which social media platforms you need to use to reach your target audience. And based on this, you’ll need to come up with a content and communications strategy relevant for the platform. What’s crucial for brands to remember is that each eSports game has its very own fanbase. This fanbase will typically remain loyal to a specific game, genre, or format. So there’s a drastic difference between different fanbases, even within the eSports community, making it impossible to lump them all together. The previously-cited Pulsar analysis also found that different games have dedicated communities. And these communities rarely talk about different games other than the ones in which they belong. So for instance, you may not necessarily have League of Legends buffs being a fan of Counter Strike as well. What this means for brands is that when you’re trying to reach multiple audiences within the community, you will need a separate strategy to target and communicate with each fanbase. There’s no one-size-fits-all marketing strategy when it comes to reaching the eSports community. To truly understand the eSports community, you need to start understanding what games they value most. This means you need to find out which games perform best within the community in terms of how many hours they spend watching them. But this also varies by platform – what’s popular on Twitch may not necessarily have the same impact on YouTube communities. According to an analysis conducted by Newzoo, Counter Strike: Global Offensive and DOTA 2 are the most-watched games on Twitch as of December 2018. Both clocked 7.9 million hours watched during the month, with League of Legends coming in third with 5.1 million hours watched. Games like Hearthstone, FIFA 19, and Call of Duty: Black Ops 4 are also on the Twitch most-watched list. These games clocked 3.9 million, 2.5 million, and 2.3 million hours watched, respectively. Among console eSports, FIFA 19 tops the list followed by Call of Duty. Street Fighter V comes next with 1.3 million hours watched. Super Smash Bros. Ultimate also performs quite well with 1.1 million hours watched. On YouTube, League of Legends tops the list with 3 million hours watched. So it seems to be the only game with an almost equal impact on both Twitch and YouTube communities. 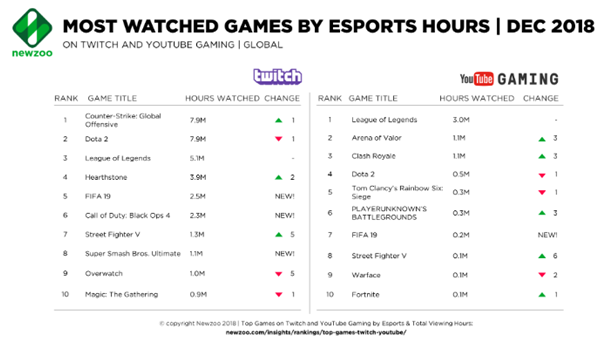 Arena of Valor and Clash Royale make an appearance by tying in the top two positions, although they did not feature in the Twitch most-watched list. Both of these games clocked 1.1 million hours watched in December 2018. DOTA 2 comes next with 500,000 hours watched, which is still a major difference from its performance on Twitch. Although Counter Strike topped the Twitch most-watched list, it does not seem to have as much impact on the YouTube community. It did not even rank in the top 10 most-watched list. These differences show the drastic differences in behaviour and preferences based on different platforms even within the eSports community. So since each gaming community within eSports is drastically different, brands will benefit from identifying the most active and most popular communities. This will help them understand which communities to target to get the most out of their marketing budget and efforts. Targeting the larger and more engaged communities will likely deliver better results. Understanding the eSports community also requires understanding how enthusiasts discover and interact with brands. This will help you come up with a more effective strategy to reach them and market to them. 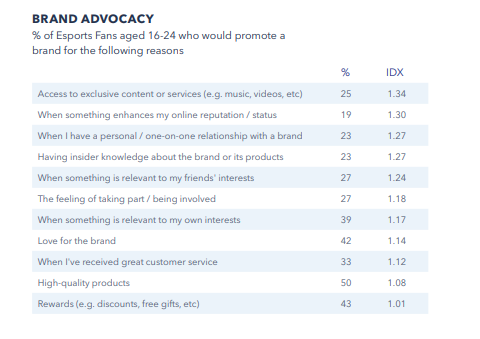 According to the previously-cited GlobalWebIndex survey, most eSports fans aged between 16 and 24 discover brands through ads. 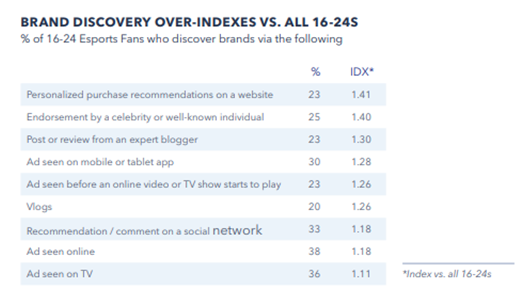 Social media and influencers also play an important role in the brand discovery journey of these fans. 38% of those surveyed cited online ads as their brand discovery channel, while 36% discovered brands through TV ads. 30% also discovered brands through the ads they see on their mobile or tablet apps. For 33%, comments and recommendations on social networking platforms helped them discover brands. 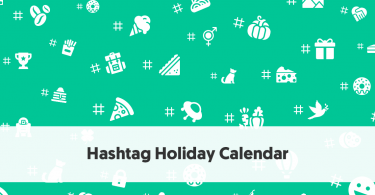 25% learn about brands when a celebrity or influencer endorses them. Another 23% also discovered brands through reviews and posts that come from an expert blogger. These numbers show how effective influencers can be in marketing to the eSports community. With that said, you can’t just get eSports influencers to promote your brand because you’re paying them. The same study found that the most common reason eSports fans promote a brand is because of product quality. 50% said that they would promote a brand if it has high-quality products. 43% also said that they would promote a brand in exchange for rewards. This includes discounts, free gifts, etc. And 42% would promote a brand just because they love it. So you can see how brand loyalty is crucial for inspiring brand advocacy within the eSports community. These numbers and analytics reveal details about the eSports communities that brands and marketers should understand before targeting them in their campaigns. Make a note of the platform preferences and most-watched video games to understand where to launch your campaigns and whom to target. Similarly, use the brand discovery and advocacy data to understand what kind of campaign you should launch to reach eSports communities.